Linz, located at the river Donau in Upper Austria, is a city of many faces. Art as well as music play a major role. Modern art museums and various concert events during the year make Linz a favorite place to visit. Historic buildings, some even dating back to 799 draw history lovers to Linz. The location of the city at a river invites to take excursions by boat for a change. Hours can be spent in the beautiful Botanic Gardens, taking you to another world. An important thing to know for persons with a sweet tooth: make sure to sample a piece of the famous “Linzertorte”, a very delicious dessert. 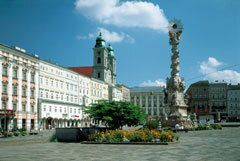 Linz, European Capital of Culture in 2009, unites the historical charm with the modern technologies. Stay a few days and you will be delighted. Linz has many interesting sights to visit; from churches to museums, from concert halls to historic transportation methods. There is something for every taste. Built in 1513, this building has Gothic, Renaissance, Baroque and contemporary elements. Today it houses the seat of the city council and the central administration. Visit the beautiful arcade courtyard and also pay a visit to the "Linz-Genesis" museum, concentrating on the history of Linz. At the Main Square, a 20 m/66 ft high Baroque Trinity Column, flanked by the patron saints Sebastian, Florian and Carlo Borromeo can be admired. The white marble is inscribed with 3 announcements, among them the gratitude of the people of Linz for deliverance from the dangers of war, fire and plague (1704-1713). Close to the seat of the Upper Austrian provincial government, the church of the Minor Friars was once a twin nave church of the monastery of the Minor Friars. It was returned to the order in 1678 and then redesigned with opulent decorations. The seat of the Upper Austrian provincial government, parliament and governor is a Renaissance building with three inner courtyards. A fountain, called the “Planetenbrunnen” (planet fountain) was built in 1582 and shows bronzes of the moon, Mercury, Venus, the sun, Mars, Saturn and Jupiter. Do you know Wolfgang Amadeus Mozart's Symphony No.36, also known as "Linz Symphony"? Mozart composed it in the Mozarthaus, a building from the second half of the 16th century. He was then guest of the Count of Thun and resided in this three-story Renaissance house. Emperor Friedrich III rebuilt this castle in 1477 which was first documented in 799. In 1600 the castle was redesigned and expanded, which still can be recognized by the two inner courtyards and the main gate to the city. The castle also served as a hospital during the Napoleonic wars, as a prison and later on as a barracks. Nowadays it is a museum and shows permanent exhibitions of art, historical weapons, music instruments etc and also displays special exhibitions each year. Also documented in 799, St. Martin's Church is the oldest original church existing in Austria. The central structure was built during the Carolingian period (after 788) and redesigned in the 11th century. Roman stone inscriptions and a furnace are visible inside the church which can be visited with a tour guide only. The Bishop of Linz in 1855, F.J. Rudiger, initiated the construction of this neo-Gothic cathedral. The height of the tower was restricted to 134 m/440 ft. as it was not allowed to surpass St. Stephen's Cathedral in Vienna. 20'000 worshippers find seats and can admire the largest nativity scene, measuring 12 m/39 ft. in length at Christmas. Where there is a new cathedral, there also must be an old one. The old one, also called "Ignatiuskirche" (Ignatius church) was built between 1669 and 1867 and served as the cathedral church of the diocese of Linz from 1785-1909. Take a look at 8'000 types of plants in an area of 43'000 m2/26'718 square ft. In five greenhouses, the exhibited plants are grouped in complete landscapes, making the visitor believe to be in the plant's natural habitat. Special exhibitions and attractions make your visit even more worthwhile. The location of Linz is ideal to take a boat tour on the Danube, e.g. on the passenger-steamship of 1912, a paddle steamer or travel to Passau or Vienna on the "MFS Kaiserin Elisabeth". The Guinness Book of Records notes that the Pöstlingbergbahn, constructed in 1898, is Europe's steepest mountain railway. Take a seat and cover the 2.9 km/2 miles in 16 minutes (height difference 255 m/837 ft). 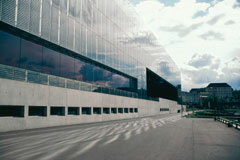 In 2003, Linz got a new modern art museum called "Lentos". This glass and fair-faced structure is illuminated at night in various colors and can be seen from the river Danube. The Lentos has a collection of about 1500 works of art, paintings, sculptures and object art as well as more than 850 photographs. There are various exhibitions to be seen. The Lentos - a piece of art itself. Linz is located in the district “Upper Austria”, at the river Donau (which is linked to the Rhine and Main), approx. 30 km/19 miles from the Czech border, 184 km/114 miles from Vienna, 220 km/137 miles from Graz and 300 km/186 miles from Salzburg. Linz has its own airport, located outside the city with a bus running frequently from and to the city. Intercity and Eurocity trains connect Linz with Salzburg and Vienna.